The LCD screen on the iPhone 3GS is far from perfect, but it's also significantly better than the much-touted AM-OLED display on the Google Nexus One, a scientific comparison of the two displays has found. Dr. Raymond Soneira, president of DisplayMate Technologies, has published the first in a three-part series comparing the much-touted AMOLED display on the Google Nexus One with last year's iPhone 3GS. Parts two and three of the in-depth look are due to be published in the days to come at both displaymate.com and displayblog.com. He also spoke with AppleInsider about his time with the Nexus one and its comparison to the iPhone 3GS. Soneira's discovery that the Nexus One screen is inferior to the iPhone is interesting, because many who spent time with both handsets said they found the Nexus One OLED display to be superior. But Soneira said eyeballing the screens isn't enough. For his tests, he had the Nexus One, iPhone 3GS and a professional broadcast studio monitor all next to one another. The same image would be displayed on all three devices, and the two handsets were compared to the monitor. The result: While the Nexus One might have a bright, eye-catching display, it also has lots of noise and artifacts, and it just isn't accurate. He said most users are probably wowed by the Nexus One display for the same reason people buy TVs at electronics stores with the brightest and most exaggerated picture —it looks great at the store, but at home it just isn't right. "The Nexus One really exaggerates the colors, and when you first look at it, it looks great," Soneira told AppleInsider. "But if you know what a picture is supposed to look like, then it doesn't look so good, because there's just too much color." Most high-quality displays, including the iPhone, have at least 18-bit color, and emulate 24-bit color with dithering. But in his tests, Soneira found that the Nexus One screen uses only 16-bit color, which allows 32 possible intensity levels for red and blue, and 64 for green. "This is common on cheap low-end devices, but it is unacceptable for an expensive high-performance 'Super Phone' that Google claims to to be," he wrote. "All screen colors are derived from intensity mixtures of the RGP primaries —with so few levels to work with the colors are coarse and inaccurate, which produces quite noticeable false contouring in many images and photos." Soneira also found that the Nexus One display is good at showing text, icons and menu graphics. But images and resolution scaling, he said, fell far short. He demonstrated this with a photo from NASA shown on both the iPhone and Nexus One. Released with much fanfare in January, the Nexus One is a Google-branded, HTC-manufactured handset running the Android mobile operating system. One of its most expensive components was estimated to be its display, with a value of about $23.50 —second only to the handset's Snapdragon baseband processor, valued at $30.50. Soneira said the Nexus One display is best-described as "punchy," and he feels the AM-OLED screen comes across as more of a prototype than a final product. With too much color saturation on photos and poor scaling of images, the hardware was also given "very poor" marks in terms of factory calibration and quality control. Without any color and grayscale calibration, Soneira said it appears the sub-assembly "was just slapped as-is into the phone, which is common in factories that are concerned with maximizing volume and minimizing production time and costs." Specifically, the screen was measured as having poor peak brightness, screen reflectance, high ambient light contrast rating. But the OLED display also has outstanding black level brightness and contrast ratio. While the iPhone has a better display than the Nexus One, Soneira said it is far from perfect. Apple's handset has contrast that is too low and weak color saturation. 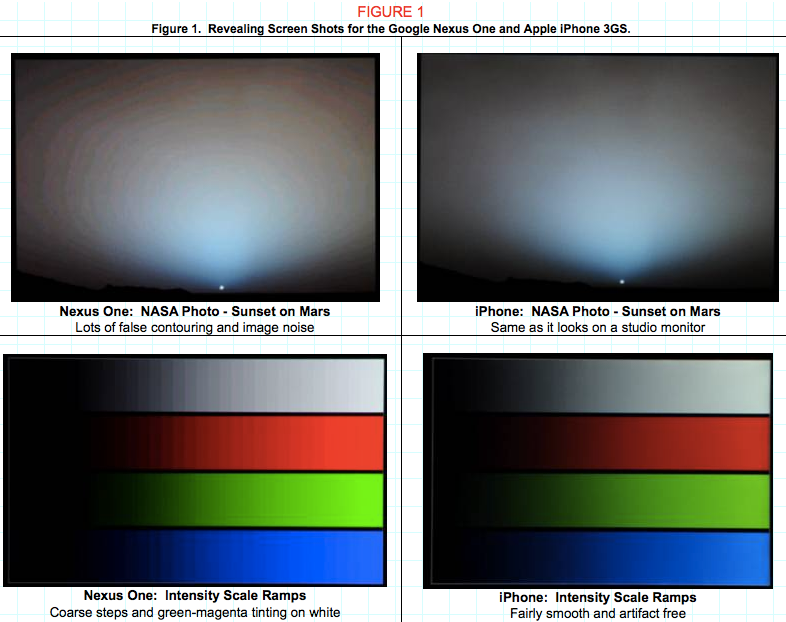 In fact, he said, the color gamut data shows the iPhone smaller and the Nexus One bigger than the standard. In that respect, the iPhone and Nexus One have taken the opposite approach. Those same issues have existed in Apple's mobile devices for years. He said it seems as though the Cupertino, Calif., company has been making compromises to deliver a bright display on its products. Soneira said the iPhone needs a "major display makeover," but Apple shouldn't' do anything drastic. The handset has a resolution that is too low, and a contrast ratio of about 100. A good LCD display, he said, has a contrast ratio of 1,000 or more. While the tech community has been very excited about OLED displays recently, Soneira said he would prefer Apple to hold off on moving to the growing display technology for a few years. He said it's likely that in two years the current issues with OLED will be worked out, and it will be the superior choice when compared to LCD. "Apple will need to think carefully, because competition has really heated up," he said. "It will be interesting. I don't think they can leave the LCD in the iPhone at 480 by 320 with its poor performance spec. I'm hoping that Apple will stick with a quality LCD and they can jump to OLED in two years when it's ready to go." As for the current standard-bearer in mobile phone displays, Soneira said he would guess that title goes to the Motorola Droid. While he hasn't done any thorough tests, he said in his educated opinion Motorola's Android-powered handset, which has a 3.7-inch screen, is the leader. But while Soneira is an expert in display technology, he also conceded that a phone is far more than its display. And taken as a whole, the iPhone again comes out ahead of the Nexus One —which he called "buggy." But while the user experience on the iPhone is top-notch, Soneira said he wishes he could say the same about the screen. "The iPhone's display, he said, "is actually not up to the standard of the rest of the iPhone." For more, read Soneira's DisplayMate Nexus One versus iPhone 3GS Display Shoot-Out.